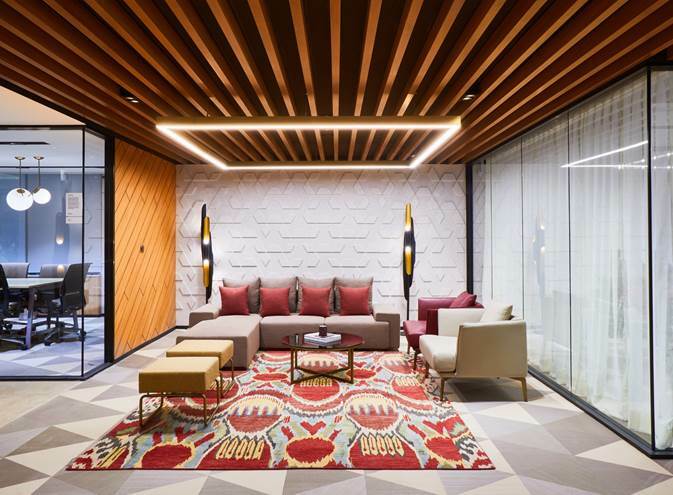 Piramal Enterprises – part of the conglomerate Piramal Group with interests in pharmaceuticals, financial services, information management, glass packaging and real estate – now has a new office in Mumbai. 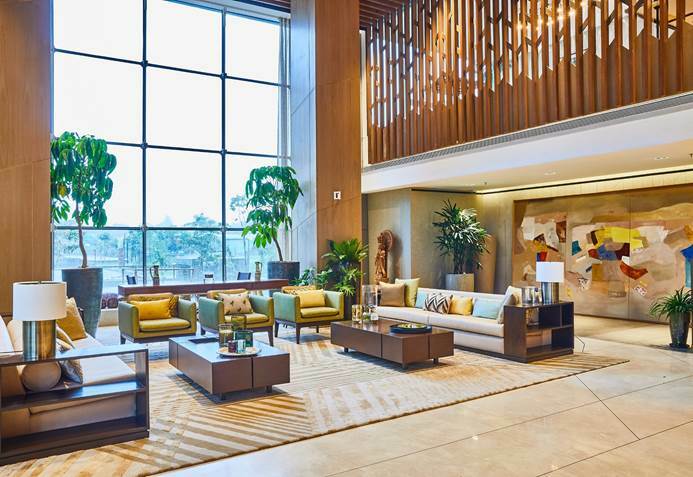 Named Ananta, it is situated in the Agastya Corporate Park in the central business area of Kurla. With a built-in space of over 700 seats, the interiors are planned around the concept of how a whole village is organized around a large central square. There are smaller street squares or nodes where people of different age groups meet and mingle with each other, thus building relationships and fostering greater bonding. This metaphor has been captured on every floor, with a large central meeting space and smaller pantry areas scattered along the floor. The privilege of light and ventilation is given to all with the meeting rooms distributed at the central core. Since people travel long to reach workplaces in Mumbai, enough resting spaces, shower rooms, crèche facilities and food provisions have been provided at strategic locations. 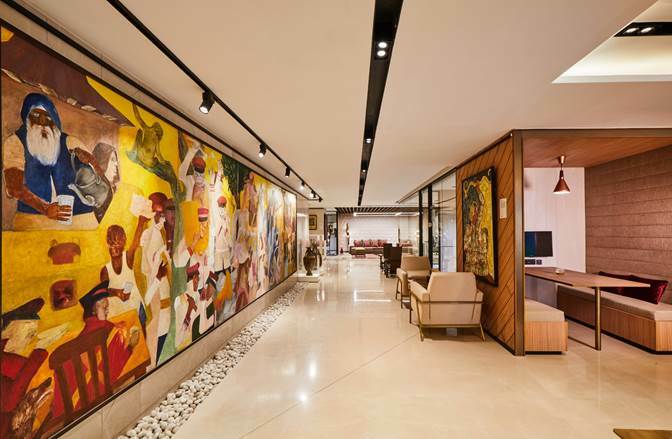 Carefully integrated greenery, colours, art and graphics create a soulful harmony. The office design is based on the principle of biophilia, which seeks to connect human life and nature, integrates natural elements of light and ventilation to create a harmonious work environment that promotes well-being and efficiency. The blend of articulated long elevations, aesthetic terracotta panels and glass is a conscious mix of modern and tradition to create a striking building façade. The double-glazed units with acoustic interlayer façade provide excellent thermal and noise insulation. Low-rise buildings framing a large central garden provide perfect interplay between work and nature. The office space seeks to dissolve physical hierarchy. 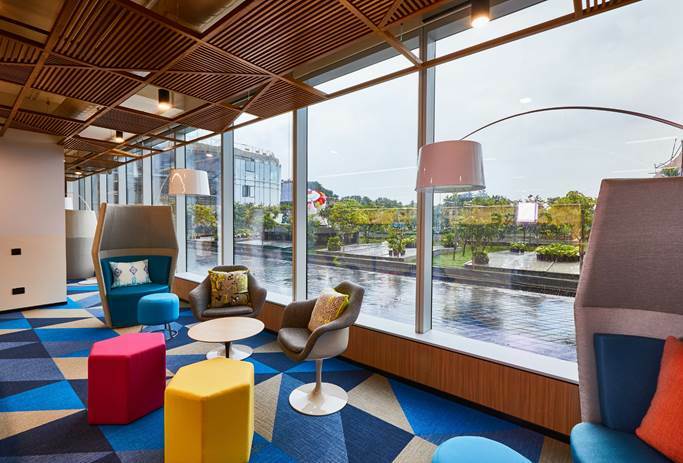 There are a variety of collaborative spaces and breakout areas for a more conversational and connected working. 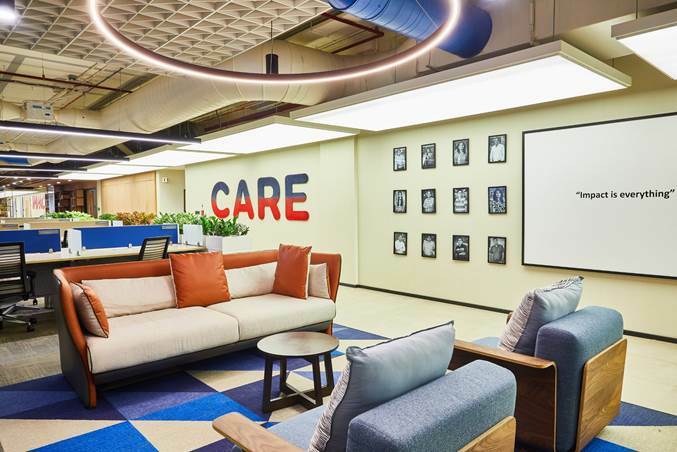 Facilities to improve employee experience and to provide a healthy work-life balance include a gymnasium, games room, massage room and complimentary canteen. Piramal Enterprises provides a flexible work-hour policy for employees and offers them choice to work from home for two days in a month. It also offers six months of maternal leave and up to seven days of paternal leave for new parents.